City Hall, Marine City, Michigan has sat empty for over a decade. Designed the noted architects Mason and Rice and built in 1884, the building is on the National Register of Historic Places and is a single resource historic district. The city does not have the money to restore the interior and does not qualify for the kind of grants that could pay for restoration. My nonprofit, Friends of City Hall, was founded in 2011 to preserve, protect and promote this grand old building. City government policy has recently changed and Friends of City Hall (FOCH) was able to sign a ten year lease on the main portion of the building. FOCH has a business plan in place that turns restored main floor space into a rental venue. 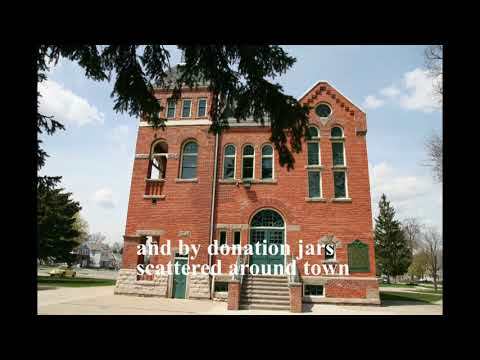 Following the example of restoration efforts like the Howell Opera House, Howell, Michigan, we are sure we can develop a popular and thriving facility for weddings, parties, celebrations and civic gatherings. Our business will hire many people and contract with many providers. But there is one major hurdle for us. Our main entrance must be ADA (Americans Disabilities Act) compliant. Nothing about any entrance to this late 19ty century building is accessible to the handicapped, the elderly or infirm. The main floor sits four feet above grade. We want to and we must install a platform lift, sometimes called a porch lift, in the ground level foyer to serve all visitors' and occupants' needs. Anyone who has used a wheelchair or assisted someone in a chair or other device knows the ADA laws are a blessing. Dimensions of the foyer do not permit the construction of a ramp. A platform lift is the perfect solution and a commercial grade lift costs about $10,000. Please help us raise this money and take an important step in revitalizing this building.